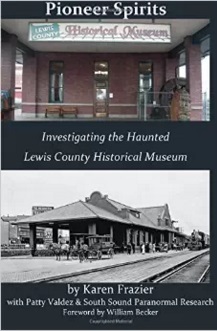 Karen Frazier is the author of three paranormal/metaphysical books: Avalanche of Spirits: The Ghosts of Wellington, Dancing with the Afterlife, and Pioneer Spirits: Investigating the Haunted Lewis County Historical Museum. She also co-wrote Lessons of Many Lives with hypnotherapist Melissa Watts and she's working on her current book, The Permanents: Spirits of the Old Wheeler Hotel, which she plans to publish by the end of 2015. As a professional writer, Karen has ghost written a number of books, as well as hundreds of articles about a variety of topics. She's also a published author in Chicken Soup for the Soul: Find Your Inner Strength! and Chicken Soup for the Soul: Think Possible! You can find her books on her Amazon author page. Karen is a columnist for Paranormal Underground Magazine. She currently writes two columns for the magazine: Dream Interpretation and Metaphysics and Energy Healing. Karen also co-hosts Paranormal Underground Radio In the Dark on MixLr. She formerly served as Paranormal Underground's Managing Editor. Today, she investigates with South Sound Paranormal Research. As a passionate cook and cookbook author, Karen writes food and wine articles for LoveToKnow. She also serves as the Health and Business editor on that website. Karen writes reference books and cookbooks for people on special diets for Callisto Media. She shares her favorite recipes, cooking tips, and wine tips on her blog, Recipes for My Kids. She also holds the credential California Wine Appellation Specialist (CWAS), which she earned through the San Francisco Wine School. When she's not writing, Karen designs fine jewelry. She is a Usui Reiki practitioner, as well as an ordained minister for the International Metaphysical Ministry. She has also studied numerous energy and alternative healing techniques including quantum touch, aromatherapy, and crystal healing. She holds a Bachelor of Metaphysical Science (B.MSc) and a Masters of Metaphysical Science (M.MSc) from University of Metaphysics, and a PhD in Metaphysical Parapsychology from the University of Sedona. Karen volunteered as a Guardian Ad Litem for abused and neglected children, in local classrooms as a music tutor, in the phone room for the local crisis clinic, and at the (haunted) Lewis County Historical Museum. I write with empathy and compassion for my readers with the genuine intent to provide empowerment. I think my capacity for finding the good in things - whether it is loving others or myself, or in finding the positives of every situation - is what guides me through life. I also tune into higher guidance in everything I do; it is the source of my inspiration and creativity. My biggest successes are all of my children: the one I gave birth to, the one I inherited via marriage, and those I've created, a.k.a. my books. All are acts of love and creativity that have vastly enriched my life. Personal: I want to change the world. And, if I can't change the whole, entire world, then I want to at least inspire and empower at least one person to make positive changes in his or her life, whether big or small. I want to do this through the books I write, as well as through my interactions with everyone I meet. Business: I just want to keep writing books about topics that inspire me. I volunteered as a guardian ad litem, advocating in court for abused and neglected children in foster care. The cases could be all-consuming and quite intense. I had one case with a very frightening and violent father, and I had to recommend something in court that I knew would anger him intensely, but I knew it was right for the child. Going into that courtroom, facing him, and speaking my truth for his child's best interests was the most terrifying thing I've ever done. In the end, however, it turned out well for the child, who is now adopted into a very loving family. My favorite motto is a single word: Namaste, which means "the light in me recognizes the light in you." I love the idea of that, acknowledging that we're all made of the same stuff. I'm like a kid - virtually everyone I like is my favorite person when I'm with them. I adore family, my friends, my readers, my dogs (they're people to me), and all of the spirits I encounter in my work as a psychic. I'm currently working on loving people I don't like very much, or people who haven't been very nice to me for one reason or another. Some days I do better than others, but it's a work in progress. My favorite places are the places I've written about in my books: Wellington, Washington, the Lewis County Historical Museum, the Old Wheeler Hotel, many haunted locations, the ocean, my kitchen, my bathtub, and my son's apartment. I love organic veggies and pastured animal proteins. I totally dig my slow cooker(s). I'm an absolute sucker for sriracha. I'm a big fan of my flute and my piano. I can't live without my MacBook Pro. I really love Eden's Garden essential oils. And I love my Kindle, because I read for at least a few minutes every day. I have a lot of passions. Clearly, I love to write, which is lucky since it's how I make a living. I'm really excited about two of my writing projects, columns that I write every month for Paranormal Underground Magazine. One is a dream interpretation column, and the other is a metaphysics and energy healing column. I am an ordained metaphysical minister and a Reiki practitioner, so the fact that I get to write about those things every month in a way that potentially helps people is really cool. I just wrote a book about healing crystals called Crystal Healing for Mind, Heart, and Soul that reflects another passion. The book is about crystals, but also encompasses energy healing, meditation, mantras, and affirmations. I'm also pretty passionate about health, diet, and cooking. I write cookbooks for people on special diets for Callisto Media. I've also written a nutrition reference book and served as developmental editor on an aromatherapy book for that publisher. It's exciting to me because I love to cook, and I enjoy developing recipes. I also really love that I can help people on special diets find healthful and delicious ways to eat that will also help ease their symptoms. I think nutrition plays a huge role in our health and can have a far more profound affect on health conditions than medical treatments like drugs or surgery. I am also a metaphysical and paranormal junkie. I enjoy doing my radio show, Paranormal Underground In the Dark on MixLr every Thursday night, because I get to interview some really fascinating people, and our listeners are amazing. I also work as a psychic medium and an afterlife researcher for South Sound Paranormal Research. I'm passionate about helping people - both in body and in spirit - in that capacity. I'm excited to help people understand that love never dies, and that we go on after death. I believe people would live differently if they truly understood that. I'm also a lover of music. I play flute and piano, as well as playing a few other instruments, badly but with gusto. If I don't have a musical instrument available, I'll just sing at the top of my lungs. It's not pretty, but I enjoy it.